In autumn the habitat of the May lily is betrayed by the small red berries. The leaves of the plant are heart-shaped even when withered and on fruit-bearing plants there are two of them. There is one seed in the berry of this relative of the lily-of-the-valley, and the flesh has a sweet taste. Folk name "wineberry“, it affects birds and animals that eat the berries or leaves so they become a little "drunk“. The berries are toxic to humans, and the toxins are the same as in the lily-of-the-valley. For children, eating three to four grams of the berries becomes dangerous. 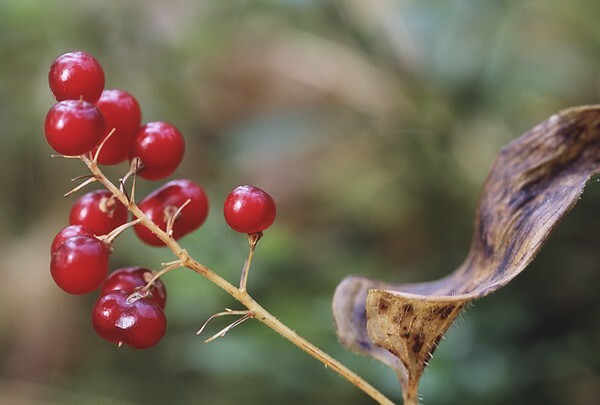 For calculation: one berry with seed weighs about 0,06 grams, and there are not very many of them in one place. So cases of poisoning by the May lily are not common.